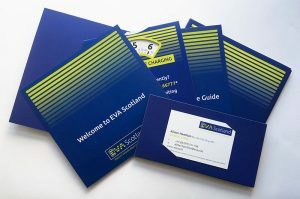 Working with our strategic communications partners, Message Matters, Brand Satellite has rebranded the Electric Vehicle Association Scotland to EVA Scotland. EVA Scotland s tarted life in 2009, as a group of individuals who had switched to electric vehicles and now aims to be the voice of the electric vehicle (EV) movement all over Scotland, supporting the electrification of all forms of transport. To be the public voice of EVs on all issues of ownership, driving, and infrastructure with stakeholders, the media, in politics, and with all levels of government, during the phasing out of new petrol and diesel cars and vans in Scotland by 2032 and beyond. With both the UK Government (by 2040) and the Scottish Government (by 2032) committed to phasing out the use of petrol and, in particular, diesel vehicles, EVA Scotland will become an important contributor electrification process. 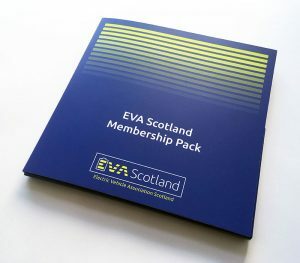 As part of EVA Scotland’s branding, Brand Satellite created a new logo and produced a membership pack, both of which were revealed at EVA Scotland’s AGM in March. Alister Hamilton, Chair of EVA Scotland.